Of course, everyone knows different knives are best suited for different purposes. 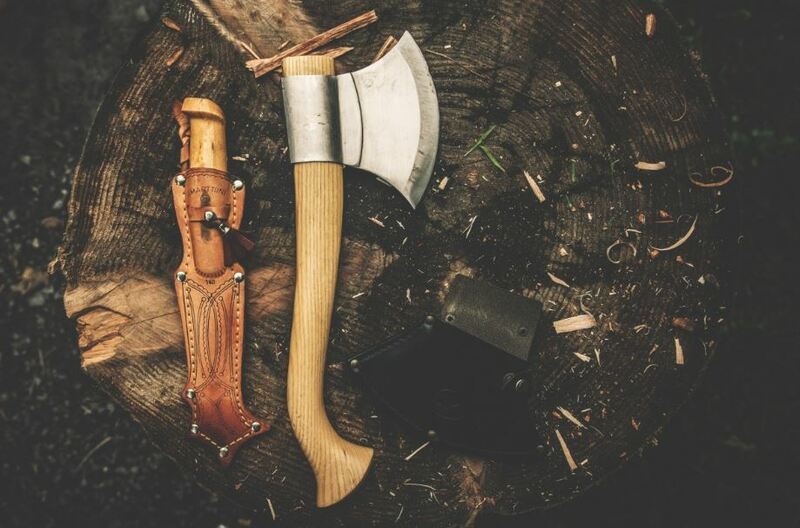 You probably have a collection of knives you use for cooking, those you use for hunting, and so on. However, there are some knives that are just irrefutably your favorite. Well here at Exquisite Knives we feel the same way. That’s why we’ve compiled a list of some our favorite, hand-crafted, gorgeous custom knives. We’ve also done you the favor of letting you know where you can find them. Michael Walker is a knife genius. And his classic Titanium Blade Folder doesn’t miss the mark. This marked blade is approximately 3.5 inches long and the OAL is approximately 8 inches. 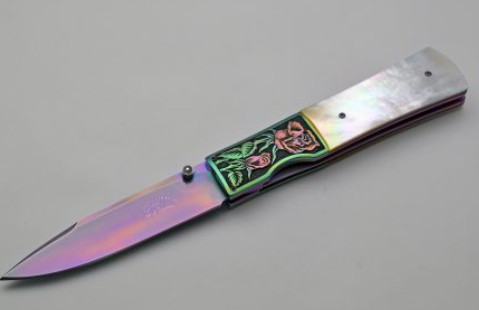 There is a variety of colors on both sides as well as beautifully hand-carved roses in anodized bolsters. Furthermore, the liners are anodized in a lovely shade. 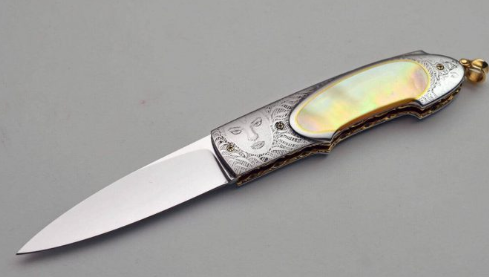 The knife also includes Presentation Grade White Pearl Scales and is really in great shape. The beauty and functionality of the knife make it one of our very favorites. Salvatore Puduu’s art folder with solid gold liners is an italian masterpiece of a knife. Not only is this italian treasure adorned with gorgeous goldlip pearl, gold liners and bail, but Martin Butler has also graced both sides with his ethereal engraving. This extra detail to attention and artistry doesn’t miss the mark- the Puduu is a one of a kind knife, complete with fileworked liners all around and pearl on the lock release. Furthermore, this knife is a great pocket/carrying size- although we don’t blame you if you don’t want it to leave the house! If you are into a bit more of a rugged approach, the CAS Black Bear is probably the knife for you. 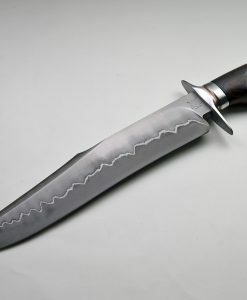 This expertly-crafted Argentinian blade is approximately 9 inches, while the OAL is approximately 14.5 inches. 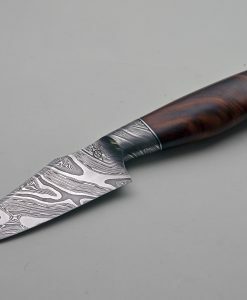 The knife features a brut-de-forge finish that looks perfect for the piece. 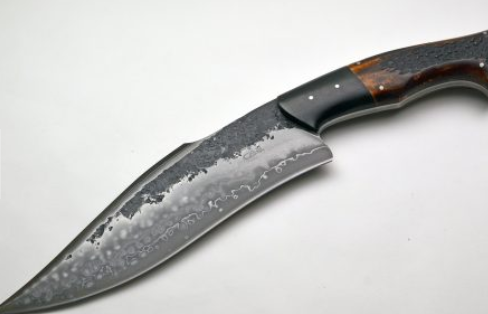 Furthermore, the knife includes composite scales of micarta and stag that add value and edge to the piece. It’s the perfect knife if you are looking to make a statement. 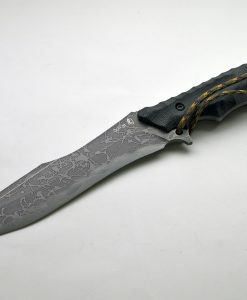 If you are interested in these knives, look no further than exquisiteknives.com, where you can find all manner of beautiful, custom knives like the ones we listed. Those knives are out favorite, now it’s time for you to find your favorite exquisite knife today!